A union has been accused of misleading farmers about the end of direct funding support after Brexit. Rural Affairs Secretary Lesley Griffiths wants to emphasise why the basic payment scheme (BPS) would not work for Wales after the UK leaves the European Union. Two different programmes for funding will replace BPS. 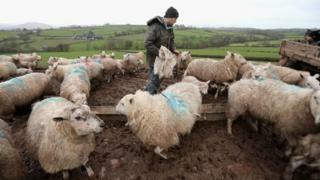 But the Farmers Union of Wales (FUW) rejected the accusation and warned the changes are "potentially catastrophic". It has asked members to sign postcards addressed to Ms Griffiths. 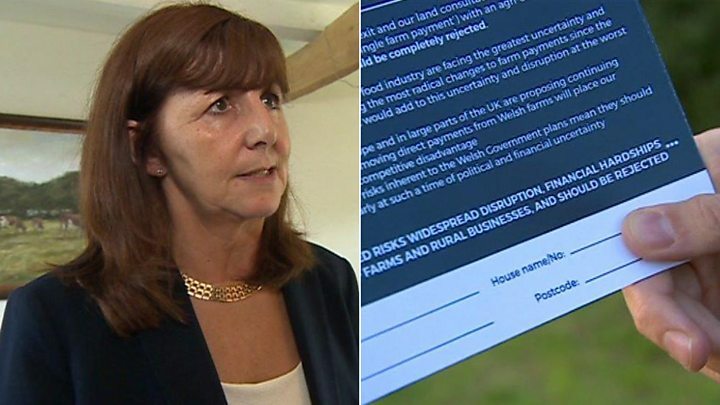 The message on the cards warns that "what is proposed risks widespread disruption, financial hardships, and the loss of farms and rural businesses, and should be rejected". It has prompted Ms Griffiths to send an open letter to farmers, along with a "myth-busting" factsheet about the replacement proposals. "We need farmers to engage properly with us to help make this work, so the recent misleading FUW campaign is not helpful," said the minister. She launched a consultation in July, Brexit and our Land, which runs until the end of October. Ms Griffiths said leaving the EU - and its Common Agricultural Policy funding mechanism - meant things had to be done differently or farmers would be worse off. Currently, most farmers receive a direct grant from a £228m pot, each paid based on how much land they have. But from 2020 it will be phased out - and they will have to apply for more targeted funding based on their food producing business and the environmental work they do. "I am open to new ideas and this is a genuine consultation but I am clear that 'business as usual' is not an option," said Ms Griffiths. What are the new payments? The ambition is to have the new schemes fully in place by 2025. Nick Fenwick, director of policy with the FUW, rejected claims of being misleading and said he believed it was unprecedented for a Welsh minister to write to farmers half way through a consultation..
"We are within our rights to highlight huge potential flaws in what they have put forward as a proposal, given the uncertainty around Brexit," he said. He explained it was a huge risk and "potentially catastrophic" to make changes before the implications were known. Ms Griffiths visited Patrick Holden's Bwlchwernen Fawr organic dairy farm at Llangybi, Ceredigion on Thursday. Mr Holden is the founder and chief executive of the Sustainable Food Trust. He worries that at the moment, through no fault of their own, some of the most profitable farms in Wales are causing environmental damage. "We need to encourage the adoption of more sustainable farming practice at scale if we are to avoid irreversible climate change, biodiversity destruction and food related ill-health," said Mr Holden. He said new policies to "shift the balance of economic advantage" to farmers who adopt more sustainable practices were needed.